From in-car sing-alongs to hip-hop trivia, sweet treats, and collaborative poetry, Lyft drivers are known for giving rides that delight. This week, ten of our community’s most creative drivers are heading to Sundance! Hundreds entered for a chance to drive in Park City, and we’re flying in the top ten to premiere their rides and spread smiles at the festival. Watch this video sneak peek to see who won a trip to Park City and follow their adventures on Twitter throughout the week. Heading to the festival? Lucky you! Ride with at least three drivers at Sundance from Thursday to Saturday to win a $50 credit. 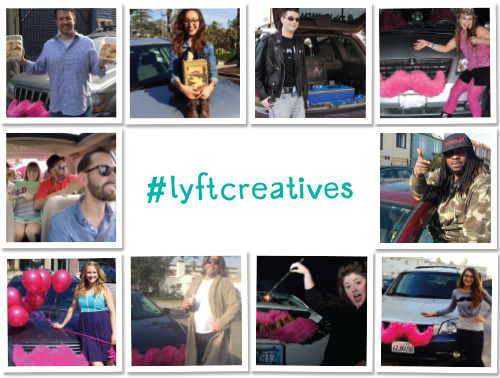 Creative Lyft drivers are popping up nationwide, so follow your favorites and share a #LyftCreatives moment whenever you meet one. Entrepreneur Chris Biggs bakes two batches of fresh cookies every morning before hitting the road. Riders vote for their favorite and the winning batch takes on a new challenger the next day. Keep an eye out for the 56-time defending champ, Salted Butterscotch! A former MC and a virtual hiphop historian, Deco Carter hosts hiphop trivia in his car where passengers compete to win prizes. He even has his own Lyft-inspired theme song. Vanessa Nelson brings the party to her car, where she has a mounted disco ball, a lyric screen with thousands of songs to choose from, and dual microphones for passengers to show off their singing chops. A professional pastry chef in Los Angeles by day, Niki Nikatos shares delicious macaroons, mustache-shaped cookies, and other unique treats with her lucky passengers. The Dude, aka Steve Peters, is ready to greet you with a laid-back fistbump, Lebowski-themed giveaways, and a heavy dose of CCR for the ride. Passengers abide. Lyft Chicago’s Christina Hardman inspires and delights passengers with a whiteboard of daily words of wisdom, positive conversation, and an all-around uplyfting experience. Natacha Bensoussan creates a magical literary experience with each Lyft. Passengers collaborate on stories, poems, and haikus in Natacha’s Decomposition book, and the final products are posted at the end of each night. A self-described “nerd of many trades,” Matthew Robbins’ ride is outfitted with 50ft of custom neon lights, great music, and a hand-crafted retro arcade in the back. Street Fighter II, anyone? Amanda Schrader channels her passion for children’s books (she’s got a masters in Children and Youth Literature) into re-creating an authentic Harry Potter experience. From the hand-sequined Gryffindor scarf adorning her car ‘stache, to a selection of treats from the Honeydukes Candy Shop, she’s got all your Hogwarts needs covered. Mike White’s music-themed ride packs a few surprises, including a full-on live bluegrass band to get you to your destination in country style.